Goodison Park is rife with history. It has been Everton Football Club’s home ground since its completion in 1892 and is one of the oldest purpose-built football stadiums in the entire world. 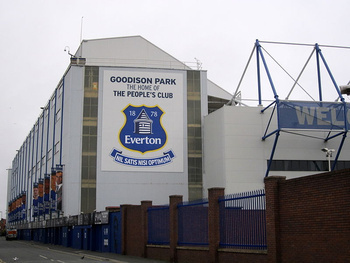 The Grand Old Lady, as it is known to Everton fans, has hosted more top-flight games than any other stadium in England. Located less than a mile from the home stadium of Everton’s fierce city rivals, Liverpool Football Club, Goodison has hosted the maximum number of league games possible since the Premier League was introduced in 1992. 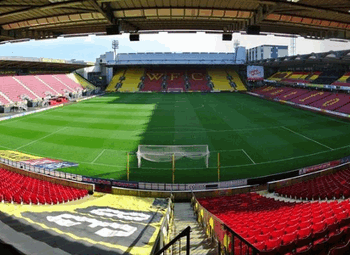 The ground has hosted the FA Cup final as well as the semi-final of the 1966 World Cup between West Germany and the Soviet Union. Goodison Park is a traditional 4-sided stadium that sits close to the pitch, allowing for an intimidating atmosphere when The Grand Old Lady is in full swing. 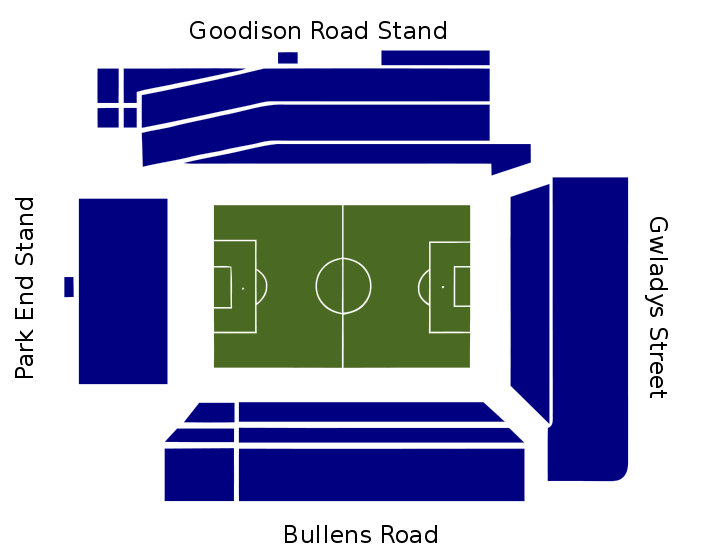 The four stands at Goodison are The Bullens Road Stand, The Goodison Road Stand, The Gwladys Street Stand and The Park End Stand. 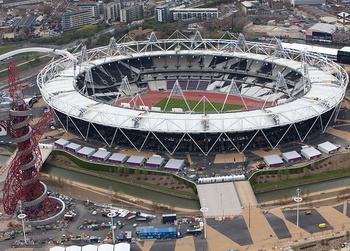 Together they give the stadium its 39,572 capacity. 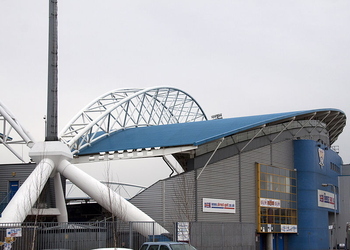 The Bullens Road Stand - Divided in the Upper Bullens, the Lower Bullens and the Paddock, the Bullens Road Stand is the area of the ground that away supporters are housed in. Its capacity is currently 10,546. The Gwladys Street Stand - Split into the Upper Gwladys and Lower Gwladys, this is the area of the ground that houses Everton’s most loyal and vocal fans. 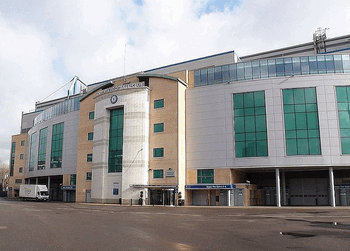 It is known to the locals as ‘The Street End’ and is behind the goal that the Blues like to attack in the second half if they win the toss. Its capacity is 10,611. The Goodison Road Stand - Famous more for the church that lies between it and The Gwladys Street Stand, The Goodison Road Stand has two decks with two tiers on the lower deck. 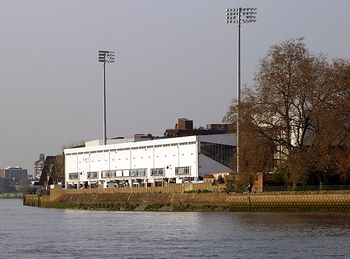 There is also a middle section known as The Main Stand that houses the family enclosure. This is also the stand that has Everton’s hospitality facilities in it. 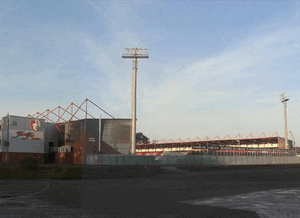 The capacity here is currently 12,664. The Park End Stand - Originally called The Stanley Park End as it backs on to the famous park that separates Goodison Park and Anfield, it is now know simple as The Park End. 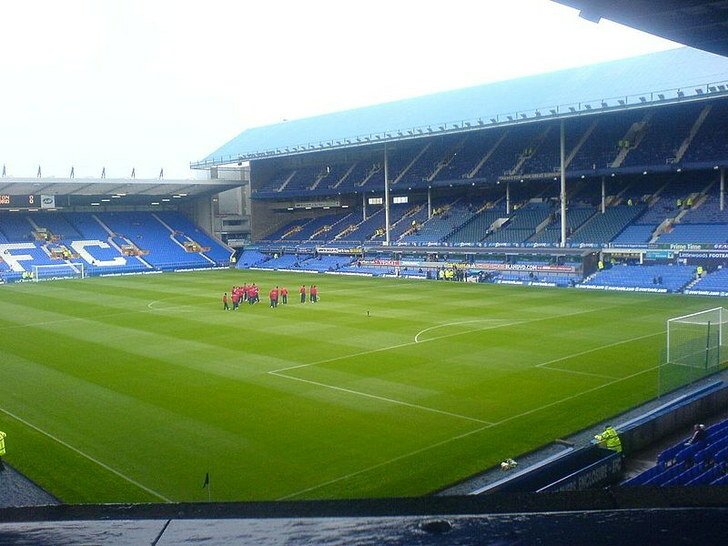 The only stand in Goodison Park to be single tiered, it has the lowest capacity in the stadium at 5750. Tickets for Goodison Park are amongst the cheapest in the Premier League. There are often tickets available for Everton matches right up until kick off, unless the match is one of the more prestigious ones, such as the Merseyside derby. The cost of tickets depends on the category of game you are hoping to see as well as how old you are. 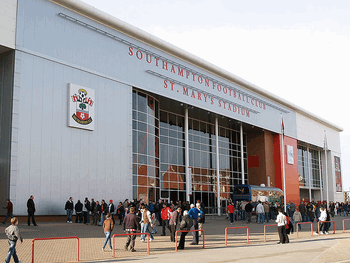 As well as standard adult tickets, Everton also offer concessions for people aged 16-20 or 65 and over. 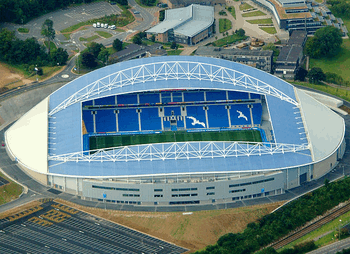 There are junior tickets available for people aged 11-15 and kids tickets for the under 11s. The following are adult and concession prices. You can get tickets online by going to www.evertonfc.com or by balling the ticket line on 0151 556 1878. You can also pick tickets up in person at Goodison Park, at the Everton Two shop in the Liverpool One shopping complex in Liverpool city centre, or at the Ticketquarter. 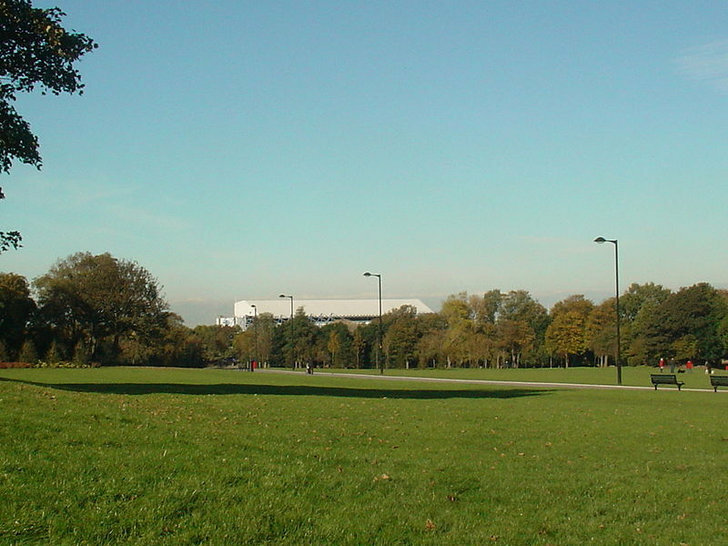 Much like Liverpool’s stadium Anfield, Goodison Park isn’t actually in the centre of Liverpool. It’s still reasonably easy to get to, though, with a host of different options available to you, including walking which would take about 50 minutes. Train - The closest national station is Liverpool Lime Street, though Kirkdale is on Merseyrail’s Northern line and is about a mile from the stadium. Taxi - A taxi from Lime Street Station to Goodison should cost about £7 and will take around 10 minutes, traffic depending. Car - The M6, junction 26 will take you on to the M58, which you can travel on until it ends and you join the M57. Exit that at junction 7 and take the A580 and you’ll be well on your way to Goodison. If you’re coming from the East then the M62 will take you to the M57 at junction 6, leading you on to the A59 and that will have you heading in the right direction. If you’re coming from the west take the M53 then go through the Mersey tunnel before following the signs to the ground. Bus - There are numerous bus routes from Liverpool centre to Goodison including the 19/19A, 20, 21, 130,, 210, and 250, from Queen’s Square Bus Station. There is also the Soccerbus that runs between Sandhills station and Goodison Park. Air - Liverpool John Lennon Airport is about 11 miles from the ground. 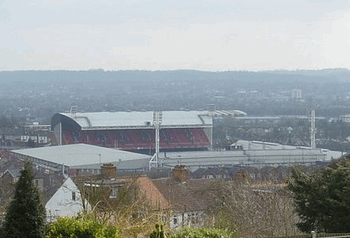 You can get a bus from their to Liverpool South Parkway bus/rail interchange and from there get either a bus towards the ground or the train to Sandhills before meeting up with the Soccerbus. A taxi would cost you around £20. 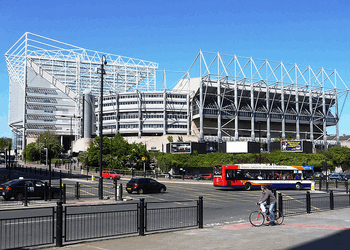 Car parking is available at Stanley Park, which is near to the ground, or you can find some on street parking a short walk from the stadium. This often fills up, though, so don’t rely on it too much if you don’t have much time to spare. Located less than a mile from Goodison Park is Trivelles, a guesthouse with 13 rooms, Wi-Fi, free parking and flatscreen TVs in the rooms. More details. The Breeze is just over a mile away from the ground, but is a lovely Guesthouse with 10 rooms, Wi-Fi, parking and breakfast included in the price. More details. The closest of the hotels on offer at just over half a mile from Goodison, Hotel Anfield has 8 rooms, a games room, concierge services and parking. More details. A Wetherspoon’s that is about 10 minutes from the ground, The Thomas Frost gets busy but does good food and offers a nice mix of home and away fans. Very much one for the home supporters and likely to get busy on a match day. Expect a raucous atmosphere. Located in Liverpool centre and therefore good for home and away supporters, The Ship & Mitre is known for its friendly atmosphere and excellent ales. Goodison Park is full of all of the top-end facilities that you’d expect from a Premier League ground; Kiosks to buy a pint in, places to grab a pie or a hot dog and even bookmaker’s huts are all located inside the concourses of the stadium. Much like with all of the league’s top teams, Everton have a club shop. 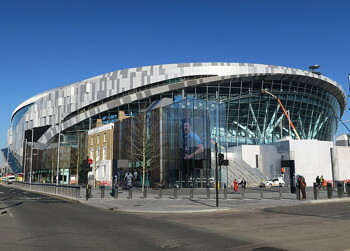 Unlike most, however, it isn’t actually part of the stadium itself. Along with the shop located in central Liverpool there is also a megastore a few minutes walk from Goodison Park. There is a smaller shop located within the footprint of Goodison that is called The Toffee Shop, though it doesn’t have as much merchandise as the megastore. Everton’s hospitality has won industry awards, so you know you’ll be in for a treat if you choose to make the most of your trip to Goodison Park with a hospitality package! As well as the usual Executive boxes you’d expect to find at a Premier League team there are also numerous lounges that you can visit and soak up the atmosphere in. There are 11 different packages to choose from, so we’ll have a look at some of the more popular ones here. The People’s Club - This is the most informal of the hospitality packages on offer at Goodison. Relax with your fellow Blues, have a meal and enjoy a cash bar before and after the match before taking your seat in the Park End Stand. You can wear your replica shirt, jeans and trainers in here and enjoy the atmosphere until kick off. 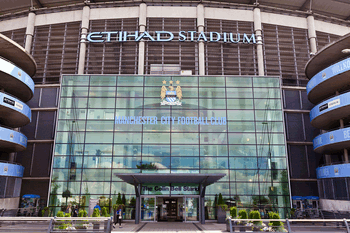 Joe Mercer - Known simply as ‘The Joe’, this is like your local pub replicated inside Goodison Park. Pub food is available to buy and there is a pre and post match cash bar there too. You’ll take your seat in the director’s box when the game starts, so no replica shirts here unfortunately. The ’85 Lounge - Named after Everton’s most successful team, The ’85 Lounge will see you enjoy a four course meal and a cash bar as well as an opportunity to meet the Man Of The Match. It’s a more intimate environment so the dress code is smart casual and no club shirts. Your seat is in the director’s box, though. The Dixie Dean Suite - As befits the most famous of Everton’s sons, The Dixie Dean Suite will have you enjoying an incredible six course meal, all-inclusive drinks and a half-way line luxury seat in the director’s box. The dress code here is formal, so it’s shirt, tie and jacket time. City Centre Matchday Hospitality - Because availability is limited at Goodison Park itself you can instead get ready for the match in Liverpool City Centre. You’ll have a two course meal hosted by a club legend as well as a couple of drinks included in the package before travelling by coach to Goodison. The Optimum Box & BT Sport Studio - One of Everton’s Unique offerings is the ability to watch the game from their Optimim box, high above the Main Stand, which includes private dining for 10 people. Alternatively you can watch from the BT Sport studio, the same place pundits and presenters of the sports channel would normally be working from. Goodison Park is an iconic venue and, as such, is the ideal place for a special occasion. Weddings, birthdays, conferences and even funerals can all be taken care of by the Everton private hire team. With a host of lounges and executive boxes to choose from there is the ability to host conferences and meetings of all shapes and sizes. Goodison Park is 120 years old and, as such, has an incredibly rich history. For that reason a tour is a ‘must do’ if you’re ever in Liverpool or the surrounding areas. The tour operates on a Monday, Wednesday and Friday at 11am and 1pm. It also runs on a Sunday at 10am, 12pm, 2pm and 4pm. 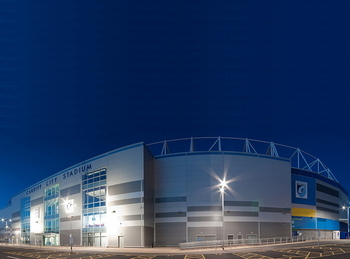 Do be aware, however, that there are no tours on match days or on the afternoon before a home fixture featuring the first team. The behind-the-scenes tour takes in the dressing rooms, tunnel and a pitch side experience as well as an opportunity to sit in the famous Goodison dugout. It lasts about an hour and fifteen minutes. You can also experience a Legends tour, which operate on a Thursday evening and will be given be an ex-Everton legend. The price for the regular tour is £12 for adults and £6 for 15 year olds and under. 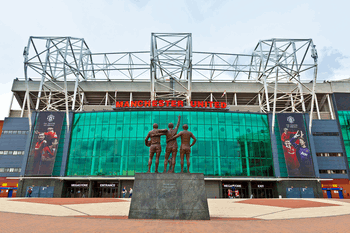 The Legends tour costs £20 for adults and concessions but £10 for Under 16s. Although Everton haven’t won a trophy for over 20 years, they remain one of the best supported clubs in England and have an incredible history. 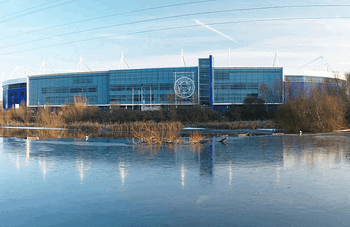 The Blues have competed in the top flight of English history for a record 112 season, spending just four seasons in the second tier of the game. In the 2016-2017 season they set the record of being the most defeated team in the history of the top-flight. 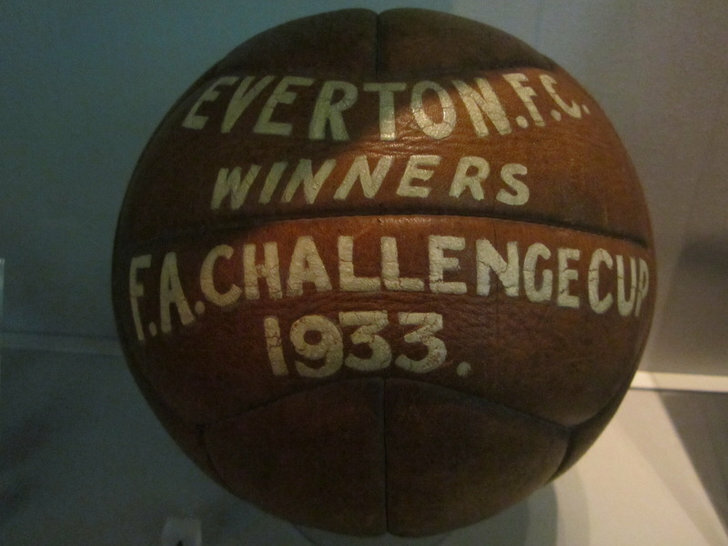 The Toffees have won the First Division title nine times, the FA Cup five times, the Charity Shield nine times and the European Cup Winners’ Cup once. Many of Everton’s former players went into club management, including Peter Reid, Joe Royle and Howard Kendall. The club loves its traditions and to this day a ‘toffee lady’ walks around the perimeter of the pitch and throws toffees into the crowd before kick off. 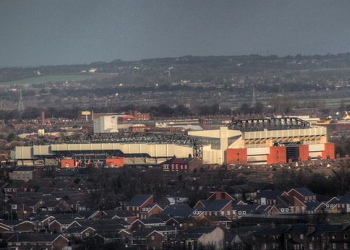 Built in a residential area and known for hosting more top flight games than any other ground in the country, The Grand Old Lady still knows how to rock when the occasion calls for it. 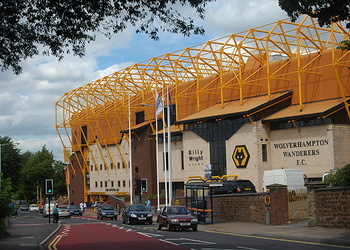 Goodson has hosted the FA Cup in the past and has also been the venue for numerous international matches, most notably some games from the 1966 World Cup Finals. Everton originally used to play at Anfield, the ground that is now home to their fierce rivals Liverpool Football Club. whilst there they become the first club to introduce goal nets to professional football. 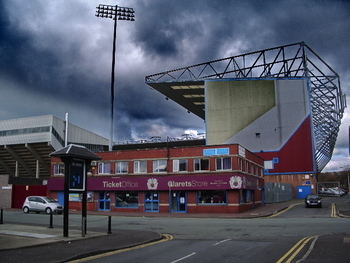 A dispute over rent with the ground’s owner led to them moving to their own purpose built stadium, however, and it became known as Goodison Park because of its location near Goodison Road. Bill Kenwright, Everton’s current chairman, has made no secret of his desire to move away from Goodison Park for a brand new stadium. 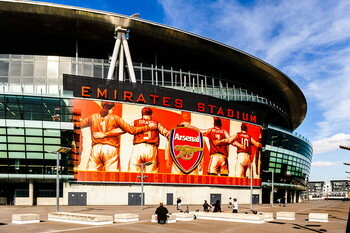 It is something of a contentious issue, however, with Everton’s fans not wanting to leave their famous ground. It is more likely that the club will move to a new 50,000 seater stadium than develop Goodison in the future.